Stornoway Coastguard helicopter rescued two crew after the jet crashed off the west coast. A Tornado jet has crashed into the sea off the west coast of Scotland. STV News understands that the two crew managed to eject from the aircraft before it came down in the sea at Loch Ewe, near Gairloch, Wester Ross, at around 2.45pm. An RAF spokeswoman said: "We are aware of an incident involving an RAF aircraft off the coast of Scotland." 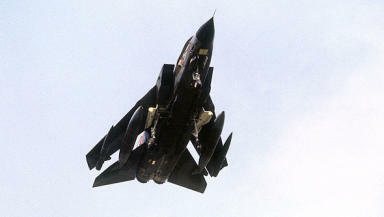 The aircraft is thought to be a GR4 fighter Tornado jet based at RAF Lossiemouth. It is understood that the aircraft caught fire before it plunged into the sea. Another Tornado is also thought to have been flying nearby - jets often fly in pairs when on training exercises. A Stornoway Coastguard rescue helicopter was called to the scene and managed to recover the pilot and navigator. They were taken to Raigmore Hospital in Inverness before 4pm. It is thought one of the crew suffered a dislocated knee and the other a sprained ankle in the crash. Staff at Raigmore Hospital described the pair as "walking wounded". Helicopter skipper Iain Campbell said: "If any day is a good day to go down, then today was it. The weather was perfect, the water flat calm and visibility excellent. It was a textbook recovery job for us which ad a happy ending. "Both men were fine but could have back injuries so we took all the precautions and flew them to Raigmore Hospital in Inverness where they are being treated. "I didn't hear much about what happened but the lads said the aircraft caught fire at 6000ft and the decision was taken to eject immediately." A spokesman for Highlands and Islands Airports said: "We can confirm that Stornoway Airport was advised of the possible diversion of a Tornado military aircraft which was in need of assistance. "A full-scale emergency was declared but emergency services have since been stood down." The RAF Currently has Tornado aircraft stationed in Scotland with 111 Squadron stationed at RAF Leuchars, and at RAF Lossiemouth with 12(b), 14, 617 and XV(R) squadrons. Armed Forces Minister Nick Harvey is presently at RAF Lossiemouth in a visit over the future of the Moray air bases. Stornoway Coastguard tug Anglian Earl, which was in the area, is at the crash site. Coastguard and lifeboat teams were coordinated from the rescue centre at Kinloss. RAF Lossiemouth, on the Moray Firth coast, is home to three squadrons of Tornado GR4s. The Tornado GR4 is a two-seat attack aircraft, capable of delivering a variety of weapons and reaching a maximum altitude of 50,000ft. In July 2009 an RAF pilot and navigator were killed when their Tornado jet crashed into a hillside in Argyll. Flight Lieutenant Kenneth Thompson, 27, and Flight Lieutenant Nigel Morton, 43, died in the crash near the village of Arrochar.